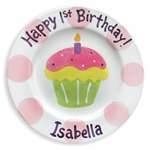 Tiny Keepsakes has a large selection of personalized happy birthday plates for kids that come in a variety of fun colors and designs. 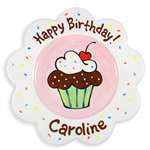 These ceramic birthday party plates are great for encouraging your kids to eat better as it is specially designed for them and can be used on a daily basis. 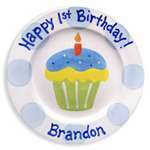 For a toddler who is just starting to eat, our personalized baby plates are a unique and fun gift. 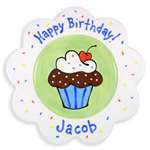 Our ceramic birthday plates are hand painted by the artist. They can include the child’s first name at no extra cost. The plates are 10” round. They’re food safe and dishwasher safe, but cannot be used in the microwave. These plates are great keepsakes for any family. 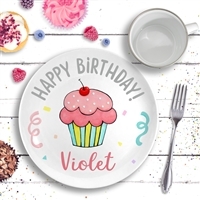 If you are looking for personalized happy birthday plates for kids or other customizable children's products, you have come to the right place. Tiny Keepsakes aims at providing only the highest quality materials and designs for our customers. Our products, like our ceramic birthday plates, are made by talented artists who design while keeping the children in mind. Browse our selection of personalized step stools, story books, growth charts and many other customized items in addition to personalized plates for kids. We are available by phone or email if you have any questions. For those who are shopping with us for the first time, be sure to use coupon code STEP to get 5% off your first order. We encourage you to sign up for our loyalty program and like our Facebook page to receive regular discount offers.